Double Bottoms are reversal patterns very similar to the bottom head and shoulders pattern, and are often seen when trading currencies. 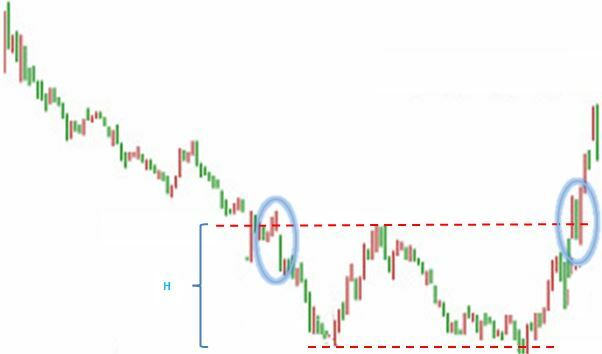 Double Bottom patterns are identified by two low prices of the same depth with a medium pullback in between. Double bottoms can be a major reversal pattern that often follow an extended downtrend. When you confirm this pattern is occurring, and there is a significant amount of volume during the uptrend, it is time to “go long”. At the second circle on the picture above, the line should be traced at the top of the pullback. Many consider the height (h in the digram) to be the height that the trend will go above the top line and will place their limit or stop orders accordingly. There should also be significant volume when the stock breaks upward; you can get a “False Flag” if you see something resembling this pattern, but no increase in volume near the end to signal the reversal is real.